There are few places I return to time and time again to eat at in Istanbul. 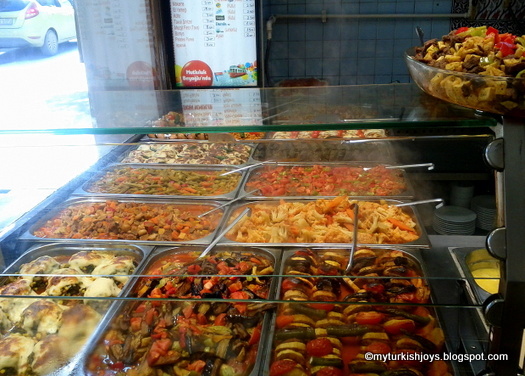 Selvi Lokanatası – a non-descript Turkish buffet-style restaurant located off of Taksim Square – is one of those places I have frequented many, many times. And it’s one you should put on your list if you’re looking for an inexpensive, home-cooked meal while you’re in Istanbul. When I was taking Turkish lessons at Dilmer, I stopped in for lunch at least twice a week at Selvi. At least I would eat a delicious meal before I started crying again or pulling my hair out over my dreadful Turkish homework. What I like about Selvi Lokantası is the food is always fresh, there’s a nice variety of menu options, the service is fast and friendly, and there’s always soup on the menu. I love soup even when it’s 90 F outside! It’s one of places where you simply point to the food that you want even if you don’t speak Turkish. However, usually, one of the workers speaks a little English. Just walk up to the counter at Selvi Lokantası and point to what you would like to order. Breakfast service starts at 6:30 a.m. with two kinds of soup in the summer and four kinds in the winter, or a traditional Turkish breakfast also is available. Lunch service begins at 11 a.m. The sign says the restaurant also serves dinner until 1 a.m. to catch the late night revelers in Taksim, but I haven’t been by that late. At that time of night, I’m more in the mood for tantuni or a late-night döner kebap. Selvi Lokantası is a longtime family-owned restaurant. In the 1950s, the father, Ayvaz Hacızade, started out with a pudding shop and later started his first restaurant with his four siblings. In 1970, the restaurant was the first to introduce the idea of self-service in Turkey. (You go up to the counter, select your food, place on it on a tray and then you pay.) Today, the son, Metin Hacızade and his wife, Çiğdem, run the restaurant. Apparently, the family has even used the same butcher for 40 years. Recently, my husband and I stopped at Selvi for lunch at 11:45 a.m. The buffet trays looked like they had just been refreshed. The four soup kettles were steaming hot. 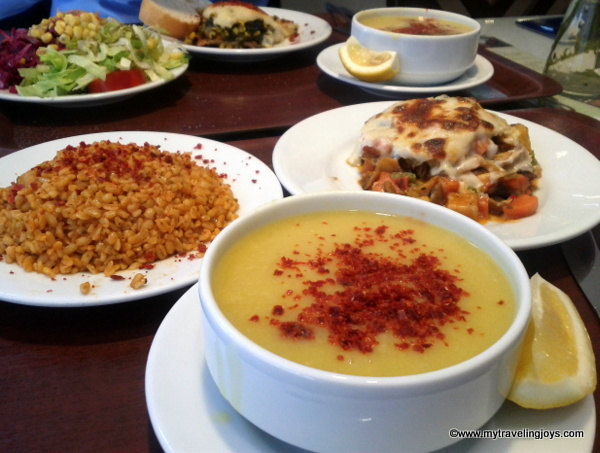 I ordered one of my favorite Turkish soups - mercimek çorbası (lentil soup). The employee pointed out the main dishes, which ones contained tavuk (chicken) or dana (beef). Our total bill, including drinks, was under 30 tl. A great bargain! When you’re done eating your home-cooked Turkish meal, one of the friendly employees will usually come around and offer you çay. I have even stayed long enough to drink two glasses of çay. I like to leave a few lira on the table for the good service. The restaurant is always busy with neighborhood locals stopping by for a quick lunch and the occasional tourist. If you arrive during the noon rush hour, you may even have to wait for a table. Katip Mustafa Çelebi Mah., Sıraselviler Cad. 6/I, Cihangir, Istanbul. If you exit out of the Taksim metro stop at the square, turn left down the street by the Burger King and row of döner kebap places. Selvi is about 10 doors down from the corner. . . the lokanta and çorbacı are two of the great joys of travel around Turkey - any time any where you'll find good, simple, inexpensive, freshly prepared food - and as much tea as you can drink. A splendid institution! what a wonderful place. i could use some of that now. i have a bad cold which is rare for me and i need comfort food. the lentil soup would be perfect! crazy st. patty's day here today. I missed these lokantas when I lived in England. When the craving got too bad, I cooked a pan of kuru fasulye and staved off the longing for a few weeks. 702 humetheThank you Joy for posting this, I'll be in Istanbul in a couple of months and I love that area, so I'll be visiting this place for sure. I know where that Burger King is, so I'll find it. Thanks for sharing again...sounds like a yummy place...hope they have Izmir Kofte that is my favorite. @Alan, I completely agree! In fact, when çorba isn't on the menu, I'm shocked. @Joyce, Happy St. Patty's Day a day late! Hope you feel better soon. @Annie, great idea! Now, you have them just outside your back door practically in Bodrum, right? @Erica (Irene), you're welcome. Hope you enjoy it as much as I do!